MARIANNE APOSTOLIDES often bikes to an art gallery after a session of writing. Looking at things from different angles and perspectives has influenced her work, particularly her forthcoming book, Deep Salt Water, a lyrical memoir, illustrated with a series of mixed-media collages by artist Catherine Mellinger. “It speaks as a work of art,” Apostolides says. 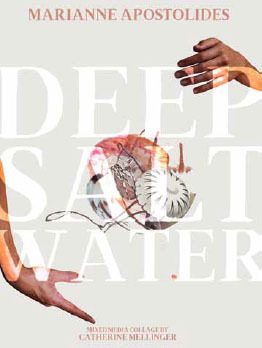 Deep Salt Water, to be published in March by BookThug, weaves together oceanic imagery with climatechange research, surreal passages, and a personal love story. 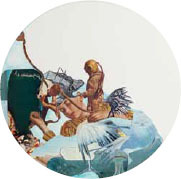 Apostolides began writing the book after Mellinger approached her about contributing text to a series of collages depicting women from the 1950s and ’60s layered with sea creatures. Apostolides, the author of five books, including the 1998 memoir Inner Hunger:A Young Woman’s Struggle Through Anorexia and Bulimia, took walks to Toronto’s High Park with printouts of the collages and wrote her thoughts and impressions about them in her journal. At first, her prevailing theme was climate change. But when the phrase “Blythe was a fish in my body” emerged, she realized she was writing the story of the abortion she’d had, and the subsequent reconnection with the man she’d become pregnant by 20 years earlier. Apostolides’s story is structured in sections titled after pregnancy trimesters. “The first trimester is all facts,” she says. 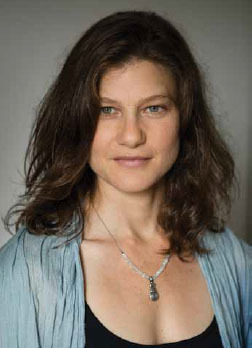 “The second includes scene-by-scene moments that are much more like prose, and the third trimester develops the themes of the book: consequence and time, origins, loss, ethics, joy, love, and how a personal experience brings us to a state of awareness of consequence, through which we become ethical beings.” A final section, Afterbirth, is devoted to climate-change research and the role of the world’s oceans in regulating climate and providing life. 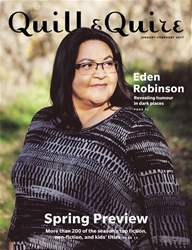 Eden Robinson: Revealing humour in dark places. Spring Preview: More than 200 of the season's top fiction, non-fiction, and kids' titles.